Over the past decade, there has been a dramatic change in June’s Bay Area dance programming. Just five years ago, the June schedule was very different from today. Certainly there were performances, but it seemed quieter. Not anymore. The last few Junes definitely indicate a new trend; a month jam-packed with outstanding dance from this region’s vibrant community. And this year is no exception. June 2016 has seen annual festivals (Walking Distance Dance Festival, Fresh Meat Festival, San Francisco Ethnic Dance Festival), home seasons (Hope Mohr Dance) and ongoing choreographic residencies (RAW at SAFEhouse Arts). Having just graduated their first class of dance MFAs, St. Mary’s College of California also introduced the MFA Student Thesis Concert Series this June; five separate programs showcasing the group’s final projects. Last night at ODC Theater, there was yet another landmark June event: the Inaugural Season of SFDanceworks, a brand new dance company under the Artistic Direction of James Sofranko. In his introductory message, Sofranko shared the vision driving SFDanceworks – to showcase breadth in dance performance, across both time and style. And with this first program, he has more than delivered on that goal and vision. Five pieces (some new, some restaged); each one a unique choreographic statement of physicality, content and form. First up were the program’s three world premieres, beginning with Penny Saunders’ Joe & Ida, a co-production with Grand Rapids Ballet. 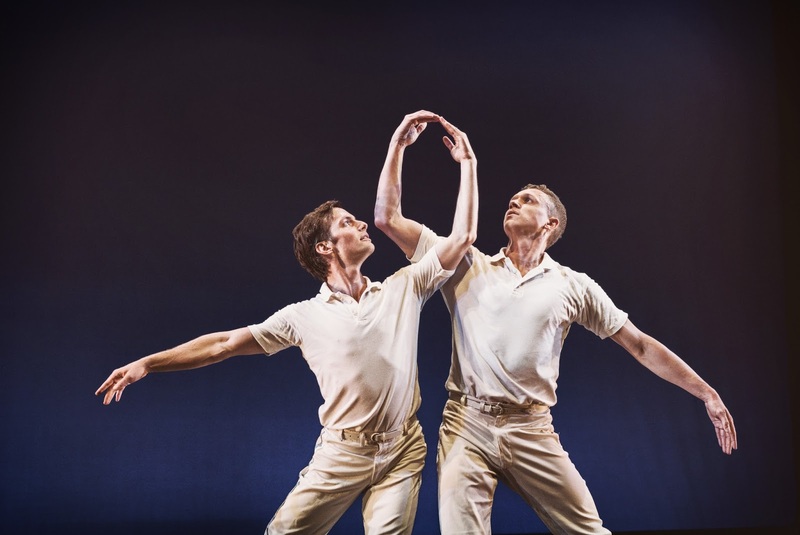 An ensemble dance for six (three men, three women), Joe & Ida is a clever artistic investigation of romance and relating. Anne Zivolich-Adams and Garrett Anderson danced a broad duet, conveying a long and varied history. In contrast, Dana Genshaft and Ben Needham-Wood’s pairing felt new but magnetic, the two clinging to each other at every moment. Near the end, we encountered the third couple in an inspired interaction. As they faced each other, Amber Neumann and Kendall Teague were being posed and orchestrated by the other four dancers – hands moved into specific positions, bodies adjusted like puppets. It was like they were trying to teach the two how to relate to each other. This was met with a priceless look from Neumann and Teague; a silent query of, “do we really want to relate to each other like they do?” While the three duets were the meat of Joe & Ida, Saunders also injected several sections where everyone was onstage, including the spectacular cannoned wave sequence. Not only did this provide a sense of the whole but also, it explored the notion of relating as a collective. Choreographically, Saunders defies categorization, and in a good way. From contemporary release technique to fencing motifs to robotic isolations to gesture to Fosse-inspired vignettes – Joe & Ida had it all and it all fit together. And the choreographic impetus and point of articulation particularly fascinated - movements initiating from the limbs, the torso, the head and the spine. Shifting gears into the dance theater arena, members of the company rolled out a large square of white material center stage. Onto it, a stunning video of rustling flowers appeared and Neumann stepped into a living meadow. This was the opening image for Genshaft’s Portrait, a solo inspired by 19th century novelist Georges Sands, the penname of Amantine-Lucile-Aurore Dupin. Through a vivid mélange of music, costume, projection, lighting, props and choreography, Portrait celebrated a fluidity of the self and the soul. Gorgeous balances and extensions unfurled (Neumann held a lengthy attitude in second position and then effortlessly rose in relevé) as the video landscape evolved beneath her feet. The projections on the floor were a breathtaking theatrical device, but there was something else that struck about that square of material. While communicating this free and multi-faceted spirit, Genshaft had Neumann remain within that designated space. Perhaps this was to comment and highlight the societal and cultural constraints against which this individual battled. I hope Portrait is expanded at some point; I want to know more about the story. Zivolich-Adams entered from up right and crossed the back of the stage in a series of stylized ball-changes – down in plié, up in relevé - a fast-paced, staccato start to the program’s next solo. Set to music by Bob Crosby, Sofranko’s Z takes neo-classicist structure and sets it in a contemporary container. In true neo-classical style, the percussive nature of the score was revealed and accented by the choreography - the meter and the rhythmical figures reading in each physical motif. And like most neo-classical work, Z was about the dance itself, about Zivolich-Adams’ performance in the space, rather than tied to any particular narrative line. Z also brought a distinct flavor to the table – a fun, flirty and playful one. Too often, contemporary dance gets stuck in an overly serious and angsty course. But this artform can equally convey great light, joy and laughter. Z reminds us of this. Closing the first part of SFDanceworks’ inaugural program was the adagio duet from Lar Lubovitch’s Concerto Six Twenty-Two (1986), danced with precision and care by Anderson and Tobin Del Cuore. Certainly a highlight of the evening, this is a beautiful, timeless work of art filled with choreographic range. Scored by Mozart’s “Clarinet Concerto in A Major”, simple and elegant pedestrianism read as the two men walked towards each other. Sculptural positions were created as rounded arms touched overhead. Floaty jumps and brisés had a hopeful air; arabesque extensions stretched in longing. And the partnering. This excerpt is a quintessential pas de deux, a true dance of two people working together. Lubovitch crafted an experience where the performers share the partnering roles throughout – each one becoming both the supported and the supporter. Narratively, much could be read into the dance, and I’m sure there were numerous interpretations in the audience last night. For me, the mutual-ness and reciprocity in Lubovitch’s work speaks a message of compassion and grace. More than any other piece on the program, Alejandro Cerrudo’s Lickety Split (2006) felt like a contemporary suite - a collection of individual, yet interdependent statements that together formed one complete work. As the lights came up on Lickety Split, the six dancers walked in slowly and deliberately, three women from one side of the stage, three men from the other. Abruptly, four darted out of the space leaving Genshaft and Anderson alone. A tender pas de deux unfolded between them. Subsequent duets added different moods to the mix: sensuality, abandon and passion (Zivolich-Adams and Needham-Wood) alongside whimsical competition (Neumann and Del Cuore). And Anderson delighted with a comical solo that perfectly broke the fourth wall. But it was the structure of Lickety Split that really stood out. Cerrudo managed to connect each of the sections with seamlessness and ease, infusing the work with brief interludes to avoid stops and starts. Dancers slid across the stage like living curtains. One pas de deux transitioned to the next through a short trio or quartet. Unison episodes changed the stage dynamic between chapters. A constant flow of changing physicality in less than twenty minutes – the piece is indeed aptly named. As Lickety Split came to its conclusion, the entire ensemble cycled through a series of big movements and complex stage architecture. It was a fitting finale to the dance, though it was the one time in the entire program that it looked like the company needed to be on a bigger stage.